Book Review: “Questioning the Bible” by Jonathan Morrow | J.W. Wartick -"Always Have a Reason"
How do we Know what the earliest Christians believed? Why were some Gospels banned from the Bible? Did the Biblical writers lie about their identity? Has the Biblical text been corrupted over the centuries? Is the Bible, sexist, racist, homophobic, and genocidal? Which interpretation of the Bible is correct? Each of these questions is addressed through a number of means, and Morrow utilizes the latest scholarship in providing answers to these tough questions. Moreover, critical scholars like Bart Ehrman and Richard Dawkins are quoted and interacted with, which opens up avenues for more applications of the work to conversations. Really, that’s what Questioning the Bible is intended for: a way to start conversations. The book is written for an introductory audience, but it is not ultra-light or lacking in content. There is an enormous amount of information packed into a small space in each chapter here, and that information will be invaluable to the reader tackling the above questions. It is also useful for those wishing to have the everyday conversations about faith that may come up. These kinds of insights are found throughout every chapter, and can be immediately applied to everyday conversations about the faith. Finally, Morrow ends the chapter with a discussion of whether we can identify the authors of the Gospels with their traditional names/authors. Each chapter follows a similar format in that it outlines the issue, provides definitions, and then offers correction and expansion where needed. Morrow writes with a tone that maintains interest, while explaining sometimes technical arguments in ways that the average reader can understand. Another strength of the work is the way that Morrow balances different Christian viewpoints on issues like creation. Rather than assuming only one viewpoint is possible, he presents several major viewpoints in a way which favors none but allows for open dialogue about origins. At the end of each chapter there is a helpful section which summarizes three major thinking points from the chapter, provides tips for having conversations on the topic of the chapter, and provides recommended reading on the topic of that chapter. These are invaluable sections and sometimes even have little homework assignments which will allow readers to practice what they have learned. Questioning the Bible is therefore made into a very valuable study tool which may be used by small groups like youth groups or Bible study groups to explore some of the most common questions leveled towards Christians. Questioning the Bible: 11 Major Challenges to the Bible’s Authority is a great introductory work to a number of the most frequently asked questions about the Bible. It comes recommended. Disclaimer: I was provided with a review copy by the publisher. I was not obligated by the publisher to give any specific type of feedback whatsoever. 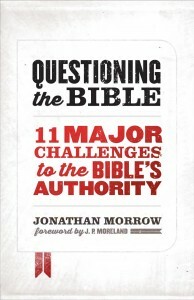 Jonathan Morrow, Questioning the Bible: 11 Major Challenges to the Bible’s Authority (Chicago: Moody Publishers, 2014). Thanks for the review. I might go pick it up.